Ricky Gervais and Stephen Merchant apparently filmed two videos in 2004 for Microsoft as training materials for its U.K. employees. Check them out here and here. 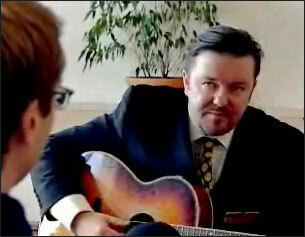 They’re long (20 minutes and 17 minutes) but often hilarious, with Gervais reprising his David Brent role from The Office. They beat the crap out of the soul-crushing piece of film that TCBY made me sit through in 1987. Via Coolz0r. UPDATE: Microsoft is unhappy that these videos have made it into the public domain and is now pressuring bloggers to remove them from their sites.